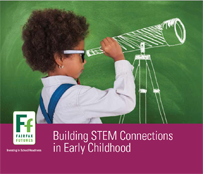 A new booklet from Fairfax Futures describes the benefits of STEM (science, technology, engineering and math) education for young children and offers developmentally appropriate experiences to ignite the curiosity and problem solving abilities of young children. Building STEM Connections in Early Childhood offers sample activities built around everyday interaction with young children at home, with friends, outdoors, or in an early childhood education setting. By sharing the child’s sense of wonder, acting as a play partner and exploring together, caregivers can help young children develop a strong foundation for later learning. The booklet also provides a list of recommended resources and apps. Building STEM Connections in Early Childhood was made possible through the generous support of Dominion and Sevatec.